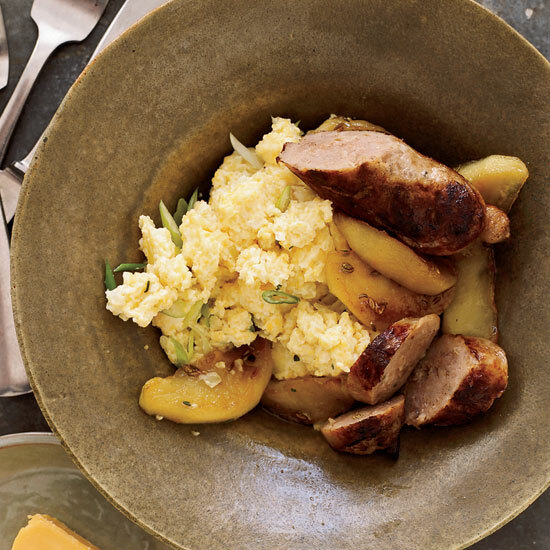 Whether it’s grilled, stewed, braised, or sautéed, sausage is the star of some of the most satisfying (and quickest) meals to make. 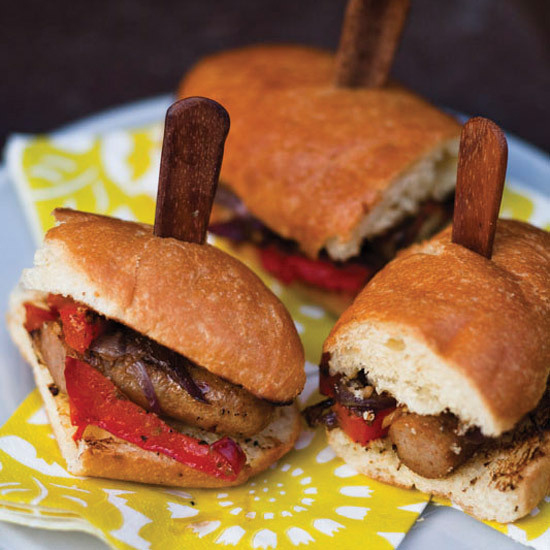 Here are a few of our favorite sausage recipes from our favorite chefs. 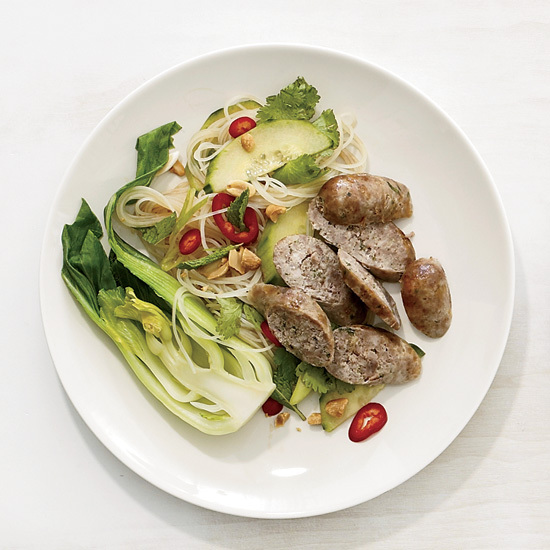 Instead of using peppers in her sausage heroes, F&W’s Kay Chun opts for sweet sautéed fennel. Chowchow is a sweet-and-sour relish. The chowchow here is studded with pieces of charred and crunchy onions, which have a smoky flavor that’s delicious with grilled sausage. 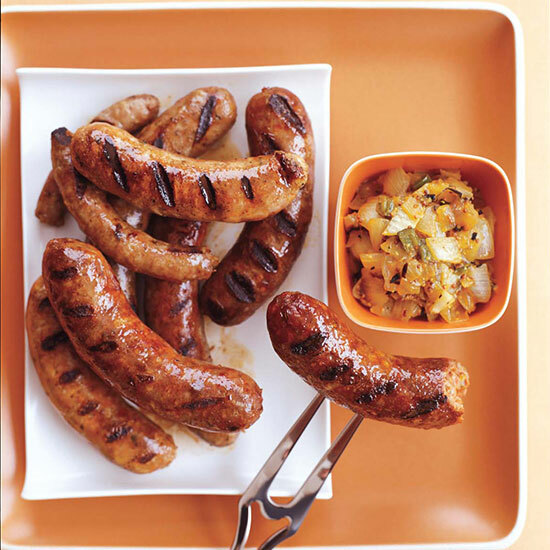 The chowchow is perfect with all types of grilled meat or poultry or as a hot dog relish. Using sausage in burgers is a smart shortcut, because the meat is already seasoned. 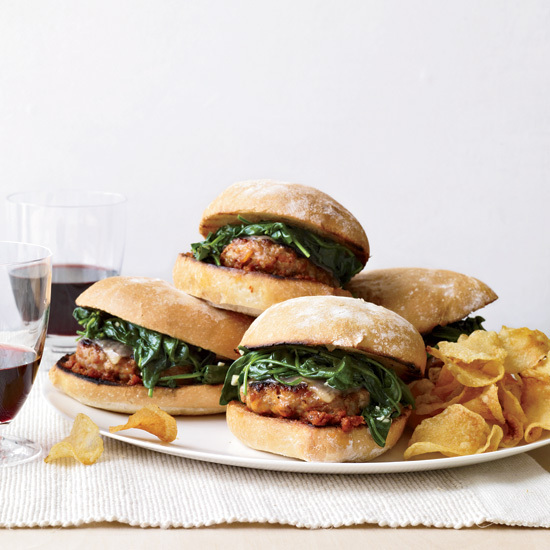 These sandwiches pair well with a smoky, intense California Syrah. 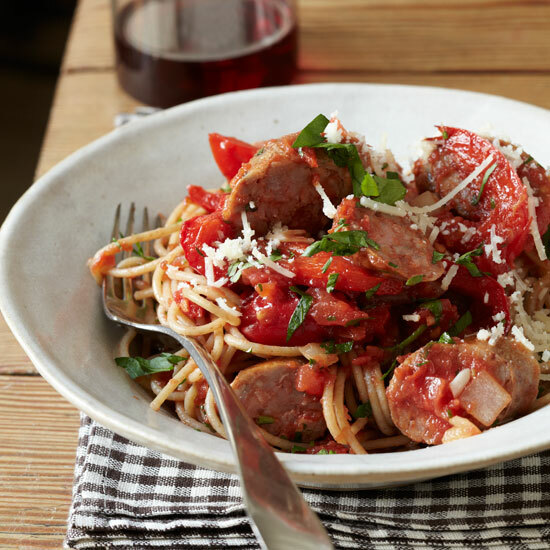 Use mild or hot Italian sausage, according to your preference, in this updated classic. We call for red bell peppers but you can use green or one of each color. Plain spaghetti can replace the whole-wheat, too. 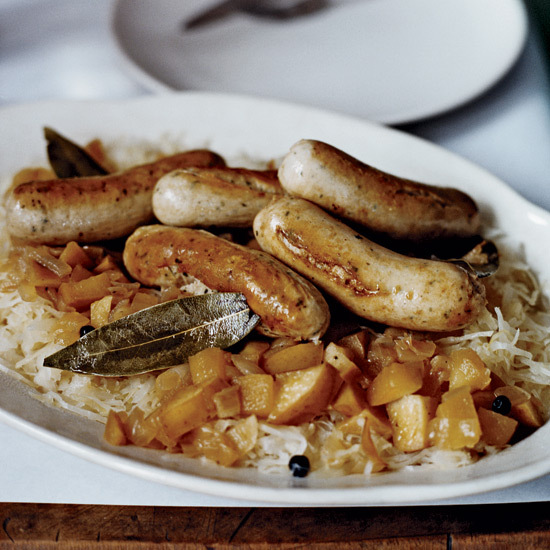 In Germany’s Pfalz region, cooks braise sauerkraut with onions, apples, seasonings, a touch of sugar and a little of the region’s Riesling wine, creating an addictive accompaniment for juicy weisswurst or bratwurst. 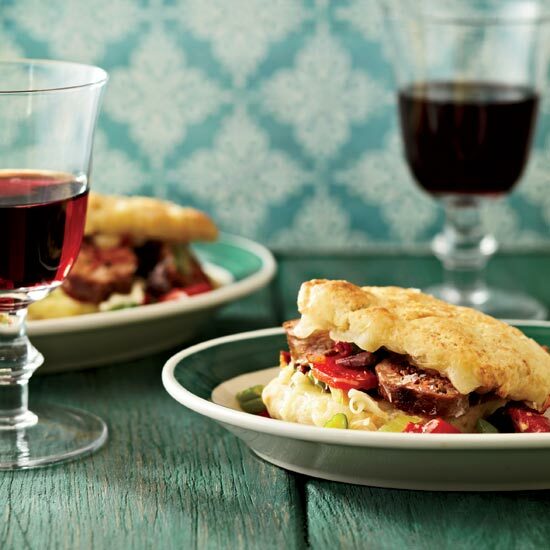 Fresh, slightly spicy Sangiovese works well with intensely flavorful dishes, like these buttery biscuits filled with spicy sausage, salty olives and rich cheese. Daniel Orr sells a number of Midwestern sausages, including bratwurst. Non-Hoosier sweet Italian sausages will work in this recipe, too. Be sure to use cooking apples that will hold their shape, like Granny Smiths, Winesaps or Rome Beauties. 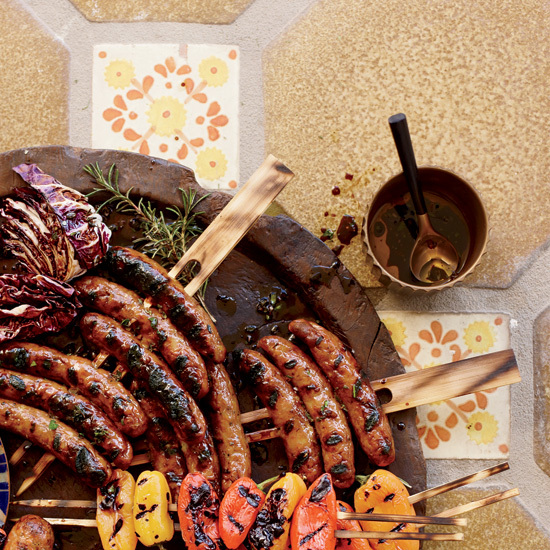 This colorful mixed grill could not be easier. Hank Shaw first tried sausages made by the Hmong—an ethnic group from Southeast Asia and China—while living in Stockton, California, and St. Paul, two cities with large Hmong communities. 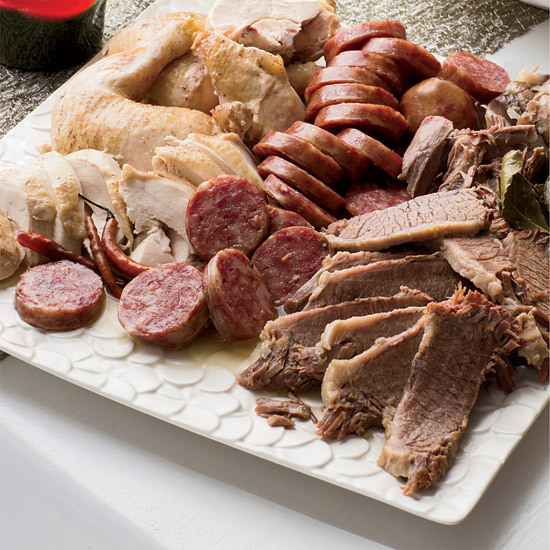 This recipe is based on a version by Hmong cookbook author Sheng Yang. 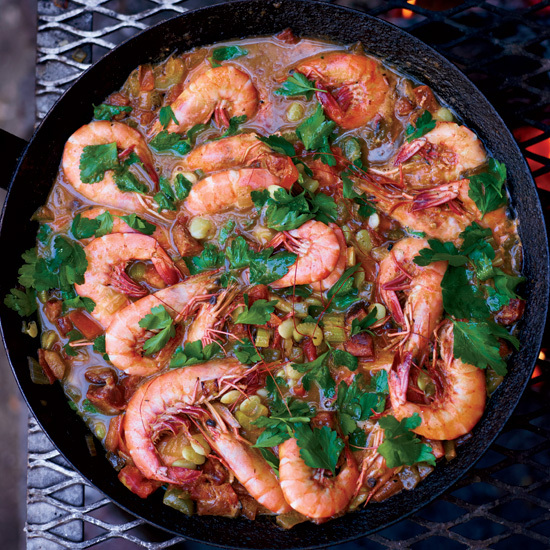 Even though Linton Hopkins’s stew is full of shrimp and sausage, the best part is the delicate lima beans, a Southern staple. 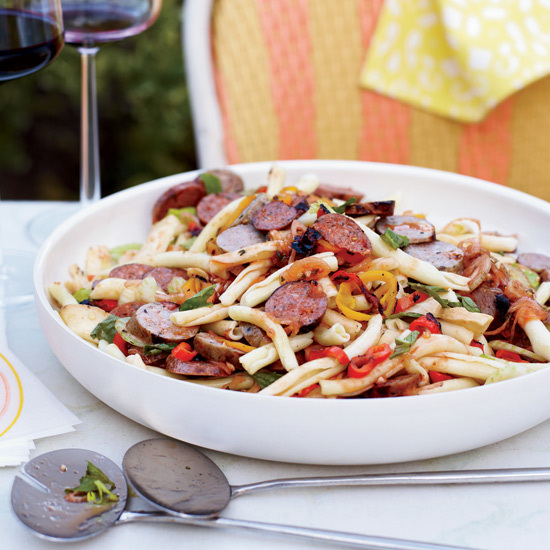 This filling pasta salad makes the perfect make-ahead side dish. Maria Helm Sinskey has a strategy for parties: there should be a mix of baked, fried and fresh hors d’oeuvres. 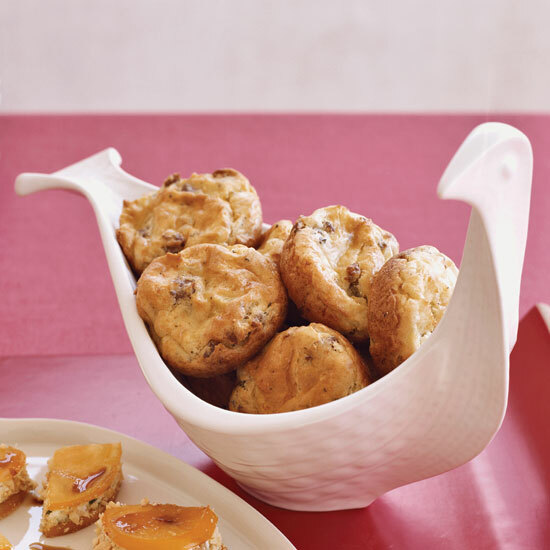 Besides ensuring that guests don’t overload on one kind of appetizer, she also avoids too much last-minute cooking. These tender potato puffs spiked with spicy sausages are one of her favorite oven-baked starters. 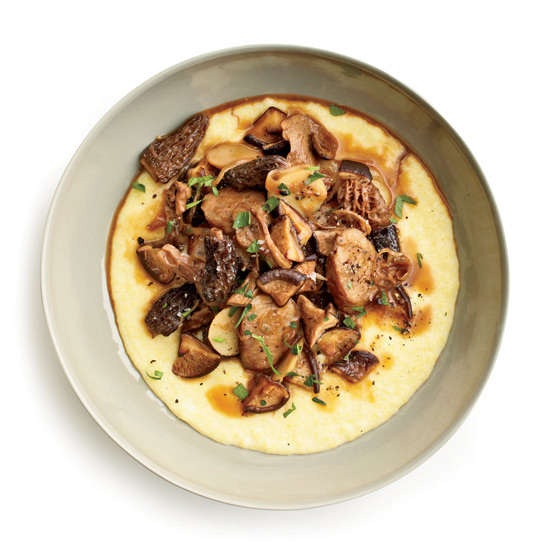 “Sautéed mushrooms can make almost any inexpensive red wine taste better,” says sommelier Jake Kosseff. 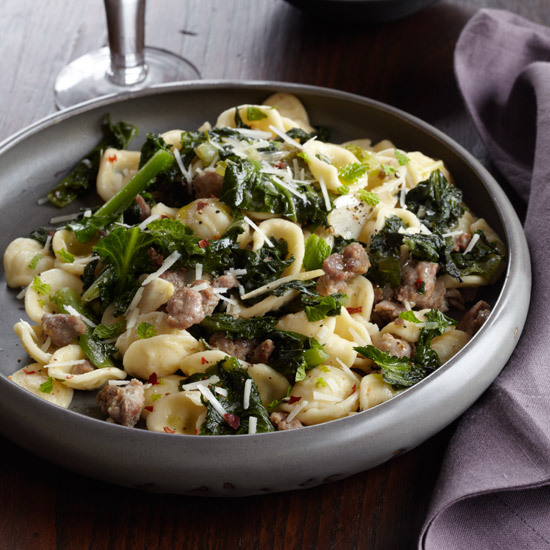 Michael White uses dandelion greens to give his slightly spicy sausage pasta a bitter edge, but chicory or escarole makes a great stand-in. 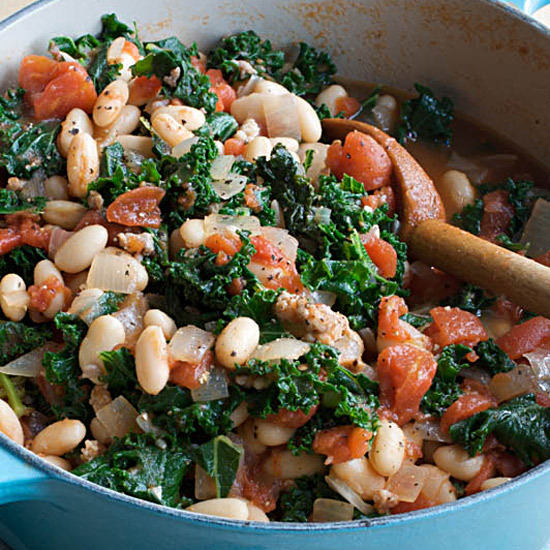 Combining two Portuguese favorites—kale-and-sausage soup and a bean, sausage, and tomato stew—makes a simple, sensational one-pot meal. 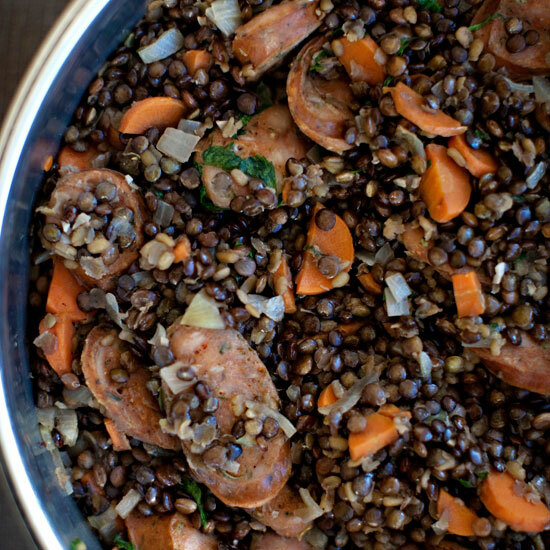 To keep the focus on the vegetables, we’ve used just a tiny amount of fresh sausage; you can add more, if you like, or substitute dried chorizo or pepperoni. 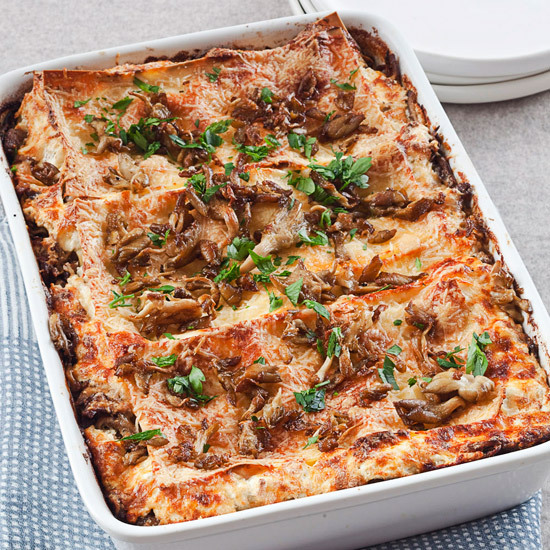 Marcia Kiesel’s earthy, meaty lasagna features two types of mushrooms, rich mushroom stock, truffled pecorino cheese and spicy merguez lamb sausage. 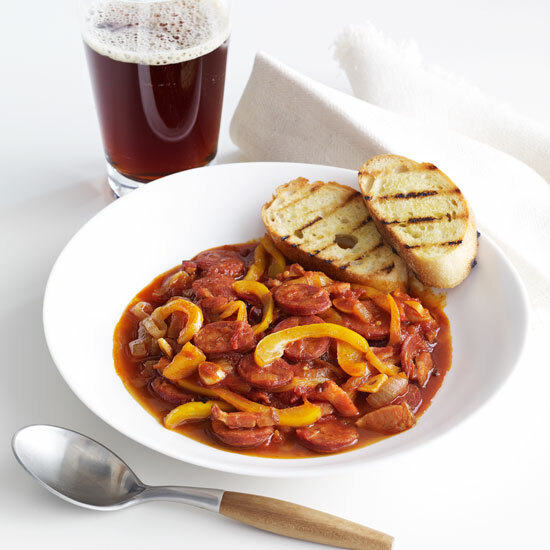 In this classic Italian dish, sausages are poached in a rich broth until deeply flavored and meltingly tender. 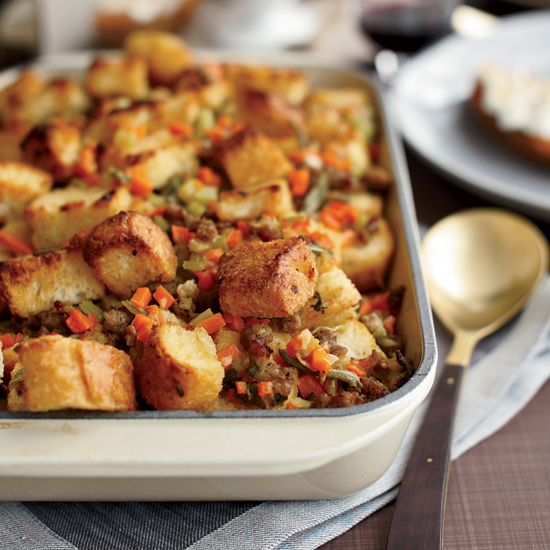 Gary Vaynerchuk’s mother, Tamara, makes Stove Top stuffing every Thanksgiving, and he proudly admits loving it. 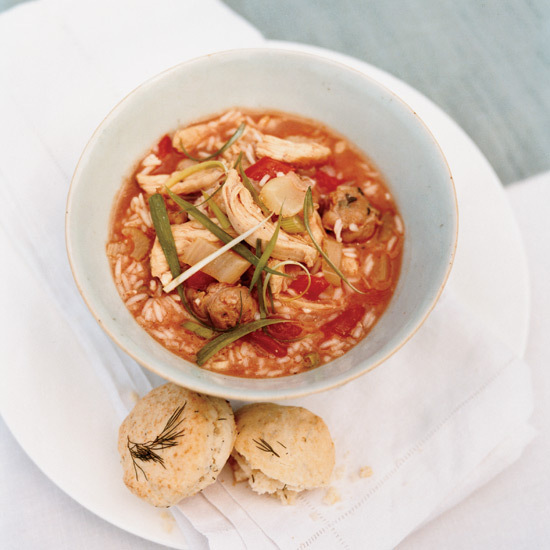 Its simplicity inspired this recipe by F&W’s Grace Parisi. Using homemade turkey stock gives it a rich flavor, but for a shortcut, use chicken broth instead. 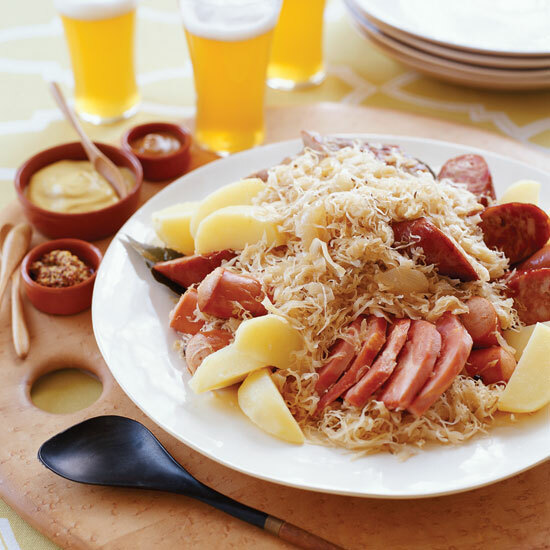 F&W's Kay Chun makes her shortcut choucroute with only five ingredients, not counting salt and pepper. F&W's Kay Chun likes making these savory muffins for breakfast instead of the more typical sweet muffin.